A coffee snob tries different K-cups. The box calls it a flavored light roast. 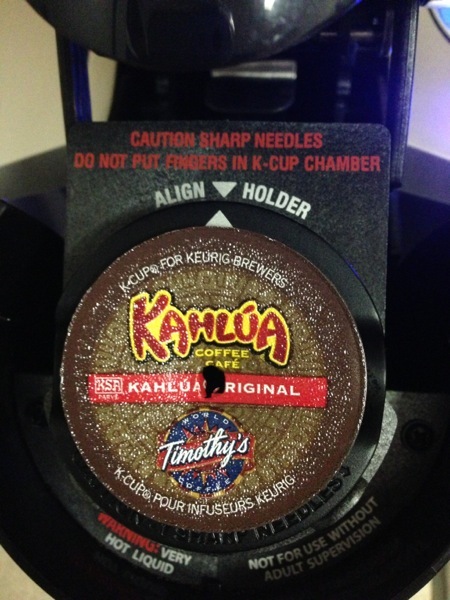 I've never tried Kahlúa so I have no comment on how this compares. The aroma was pleasant enough. The first taste was full bodied with notes of fruit cake. It felt like it was missing something. I'm guessing the alcohol? The after taste was nutty and dry, but I'm used to an oily finish that you only get from a press pot. I generally don't drink flavored coffee, and I'm not sure when this would be appropriate to drink. If you enjoy flavored coffee and fruitcake I suspect you may enjoy this. A coffee snob in search of the perfect K-cups. Signup to get my Updates! Copyright © 2014, Ron Hudson. All rights reserved.